Danielle Leibovici was born and raised in Los Angeles, California. She is the Amazon best-selling author of the multi award-winning children's picture book series; Under The Tree. Danielle is a licensed marriage family therapist, speaker, campaign fundraiser and former NICU parent. Her experiences as a psychotherapist and parent have inspired her book series. speaking engagements and fundraising campaigns. She has learned what children respond to and what parents are looking for in high quality children's picture books. Each heartwarming story, with its beautiful lifelike illustrations, incorporates simple and universal truths that all readers benefit from and enjoy. Danielle resides with her husband, children and dog in Norfolk, VA.
Adam’s life is about to change. He is waiting eagerly for his new sister to be born. But when Emma decides to make her appearance early, she has to be put in the NICU part of the hospital in a little, clear box-like home. When Adam visited his baby sister Emma, she had wires coming from different parts of her body. She was nothing like the babies he had seen on TV. Adam’s parents explained to him that because Emma was born too early, she had to stay in the NICU so the nurses could take better care of her. Adam is finding out that his life, and the life of his parents would change forever because of this wee little girl. They would have to make many adjustments as they prepare to bring Baby Emma home to live with them. Will Adam be a good big brother? I love that author Danielle Leibovici wrote this book just for brothers and sisters of babies who were born before their due date, and have spent time in the NICU department of the hospital. In reading this book, a child facing this situation can find peace, knowing what to expect, and how their sibling will be treated in this special room in the hospital. 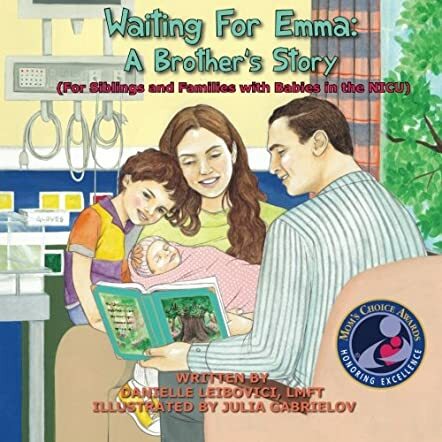 Ms. Leibovici wrote this book in a way that will help children accept what is happening, as well as what to expect when their sibling comes home. And just as Ms. Leibovici brings Adam into the planning for this new baby, she helps parents to include their other children in this big family event. This book is not only a story, it is a book filled with information for children and parents during this time of an unexpected and unprepared time in their lives. And I really love that the adorable illustrations go with the story so well. The pictures alone tell the story. This is a book that needs to be in the home of every young family. Finally, there is an exceptionally written and realistically illustrated children's book available today for siblings and families of NICU babies. The sensitivity, support, updated information, resources and activities to share with all family-members, are invaluable. Bravo! Thank you Danielle Leibovici."